Tell the Truth about ObamaCare? Don’t you dare! Republican state legislators in the California Assembly have put together a website that provides clear and straightforward information about ObamaCare, but it’s causing an uproar because they have the audacity to present the facts about the law instead of highly poll-tested half-truths. The GOP Assembly’s website is the target of columnists and Democratic legislators who say it misleads visitors, and one Democratic congresswoman is calling for it to be taken down. They apparently don’t like seeing a site that provides direct information on the requirements of the law instead of a sales pitch. Los Angeles Times columnist Michael Hiltzik wrote last week that the site mostly featured negative stories on Obamacare and a calculator of penalties that a person would pay for not buying insurance. He also complained that the site’s URL was similar to the official site of the exchange — coveredca.com — which could confuse consumers. But the GOP site links to news reports from legitimate media outlets. And they barely touch the avalanche of coverage about serious problems and negative consequences of the law. Opponents of the Affordable Care Act never stop producing new tricks to undermine the reform’s effectiveness. But leave it to California Republicans to reach for the bottom. Their goal appears to be to discredit the act by highlighting its costs and penalties rather than its potential benefits. The device chosen by the Assembly’s GOP caucus is a website at the address coveringhealthcareca.com. If that sounds suspiciously like coveredca.com, which is the real website for the California insurance exchange, it may not be a coincidence. Bogus insurance websites have sprung up all over, aiming to steer consumers away from legitimate enrollment services. Just a couple of weeks ago California Atty. Gen. Kamala Harris shut down 10 bogus insurance sites, some of them with names very similar to the real thing. She must have overlooked the GOP’s entry. It is outrageous for Hiltzik to equate the Assembly’s information site to the truly fake websites created by crooks who are trying to dupe consumers into handing over their Social Security numbers and credit card information so they can steal their identity. Hiltzik may want to read the law and its requirements. 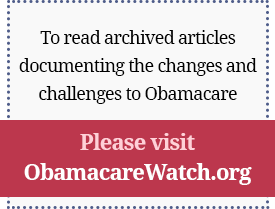 ObamaCare penalizes people who don’t buy health information. The GOP Assembly coveringhealthcareca.com website provides a calculator that allows people to figure out what their penalty would be if they don’t buy the expensive, mandated health insurance. That seems like a useful public service. Is that so? The site links to this report by the CBO, which states on page 2 that the act will “on net, reduce budget deficits over the 2012–2021 period.” Get it? Reduce the deficit, not add to it. The GOP’s nasty trick is to consider only the costs of coverage, without netting out the cost reductions and new revenues in the law. Oh, by the way, the CBO also projects that the ACA will reduce the number of uninsured people in the United States by more than 30 million. That’s a plus, by most reckoning. But Mercatus Center economist Charles Blahous, who serves as public trustee overseeing Medicare and Social Security finances, writes that flawed government accounting obscures the real cost of the law and says that it will add at least $340 billion and as much as $530 billion to the deficit over ten years. As one example, under federal accounting rules, the $716 billion in Medicare cuts are also credited as savings to that program’s trust fund. But the CBO and Medicare’s own economic estimators already said the government can’t spend the same money twice. And while the ACA could potentially cover 30 million more people if everything goes well and according to plan (Good luck with that), at least 30 million more will still be uninsured when the law is up and running. And that number could be much higher if young people don’t sign up in droves. A recent Gallup survey shows that more than a quarter of Americans don’t plan to sign up for insurance and will pay the penalty. Clearly, the truth hurts. Other states should consider doing something similar.